<h2>Refining intergalactic measurements could alter our whole understanding of physics</h2><br /><p>Professor Grzegorz Pietrzyński at the Nicolaus Copernicus Astronomical Centre of the Polish Academy of Sciences in Warsaw is one scientist trying to derive the Hubble constant by improving the calculation of almost impossibly far distances.</p> <p>The idea is that by measuring how far away objects are at different points in time, scientists can work out how fast they are moving away from us, and therefore the expansion rate of the universe. Trying to accurately measure such large distances, however, is no easy task.</p> <p>Prof. Pietrzyński’s measurements fall into the range of kiloparsecs, equivalent to roughly 3,262 light years or 30 quadrillion kilometres. And that’s just the first step.</p> <p>‘My goal is to measure geometrical distances to nearby galaxies in order to calibrate Cepheids,’ said Prof. Pietrzyński, referring to his project <a href="https://cordis.europa.eu/project/rcn/205840_en.html">CepBin</a>.</p> <p>Cepheids are a type of variable star that pulses in brightness, or luminosity, over a consistent period of time. Scientists use them to estimate distances from the Earth in the range of 100 megaparsecs (a billion trillion kilometres).</p> <p>That’s still just a fraction of the observable universe, which could be around 28,000 megaparsecs in diameter according to the book <em>Extra Dimensions in Space and Time</em>.</p> <p>‘Through Cepheids we can calibrate (the distance to) supernovae (stars’ explosion). Through supernovae we can reach very distant places in the universe and based on the supernovae we can calculate the Hubble constant,’ he said.</p> <p><strong>Small errors</strong></p> <p>The problem is that with so many links, small errors can make a large difference in the end calculation. Different spacecraft and techniques have measured different Hubble constant values.</p> <p>‘Using the classical method (with Cepheids and supernovae) we have a significantly higher Hubble constant compared to the measurement from the Planck mission,’ said Prof. Pietrzyński, referring to the space observatory&nbsp;which ran from 2009 to 2013 and measured the speed from&nbsp;cosmic background radiation.</p> <p>This matters because it could mean current theories of physics are wrong.</p> <p>‘If this is true, it means we will have to change all of physics,’ he said.</p> <p> <div class="quote-view quotesBlock quote_horizontal"> <div class="quotesTop"><img src="https://horizon-magazine.eu/sites/all/themes/horizon/images/quotes_top.png" alt="" title="" /></div> <p class="Standard"><span lang="EN-GB" style="font-size: 12.0pt; line-height: 115%; font-family: 'Arial',sans-serif;">‘Through supernovae we can reach very distant places in the universe and based on the supernovae we can calculate the Hubble constant.’</span></p> <blockquote><p>Professor Grzegorz Pietrzyński, Nicolaus Copernicus Astronomical Centre of the Polish Academy of Sciences, Warsaw</p></blockquote> <div class="quotesBottom"><img src="https://horizon-magazine.eu/sites/all/themes/horizon/images/quotes_bottom.png" alt="" title="" /></div> </div> </p> <p>To reduce the uncertainty, Prof. Pietrzyński is working to refine the distance measurement to the nearby galaxy known as the Large Magellanic Cloud by looking at binary stars that eclipse one another. The results are promising. With the help of a wave measurement known as interferometry, researchers can calibrate the stars’ angular diameter, which reveal distance when coupled with linear diameters.</p> <p>Ultimately, more accurate measurements would establish the correct value of the Hubble constant – or reveal if it has fluctuated over time.</p> <p>‘We can check how the expansion of the universe evolved. We know that at least two times the expansion accelerated,’ Prof. Pietrzyński said. He was referring to the Big Bang as well as the Nobel-Prize-winning finding that the universe is currently in a phase of accelerated expansion, which is theorised to be caused by a mysterious force called dark energy.</p> <p><strong>Supernovae</strong></p> <p>Cepheids alone are not enough to discern the vast distances needed to act as a yardstick for the universe. For that, cosmologists use a class of exploding star called Type Ia supernovae.</p> <p>Since there are no supernovae in our galaxy, researchers use relatively nearby Cepheids as the first leg in estimating the distance to the small number of observed supernovae.</p> <p>‘Cepheids are something like 10,000 times fainter than the supernovae, so the bridge of distance you have from Cepheids and supernovae is very small,’ said Dr Mickael Rigault of the French National Centre for Scientific Research.</p> <p>Dr Rigault is working on improving the accuracy of supernovae measurements.</p> <p>‘The problem is that the Type Ia supernovae are not always exactly the same. They might be intrinsically different, and we don’t&nbsp;quite know the mechanism of how they explode,’ he said.</p> <p>One issue, for instance, is that their light could cross space and be absorbed in different ways.</p> <p>‘We need to make sure to find a way to make sure the luminosity of the supernovae we are using is always the same,’ he said.</p> <p>To address this, he and his team of <a href="https://cordis.europa.eu/project/rcn/212784_en.html">USNAC</a>&nbsp;project researchers have used the NASA/ESA Hubble Space Telescope to examine supernovae host galaxies with ultraviolet images. 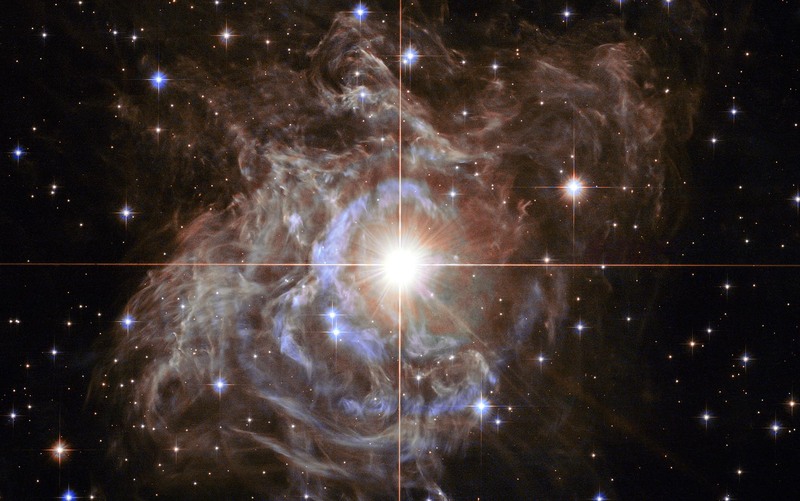 By doing this, they can measure the amount of dust left in the supernova's line of sight and gauge how such dust may alter its appeared brightness.</p> <p>More accurate measurements of supernovae, on top of more accurate Cepheid measurements, could also reveal more about the history of the universe, including the role of dark energy.</p> <p>This is because light coming from faraway supernovae takes so long to travel to Earth that by the time it gets here we are actually witnessing events that took place billions of years ago.</p> <p>‘The supernovae, because they are so bright…can go much deeper (and reach much further back in distance and time) … about half of the age of the universe,’ Dr Rigault said.</p> <p>However, even when the dust is accounted for, some uncertainties remain. For example, Dr Rigault says, it’s difficult to know if the properties of the star which explodes into a supernova affect how bright it appears. The composition could also change over time. ‘If this is not taken into account then it biases how we measure dark energy,’ he said.</p> <p>Calculations of dark energy can affect estimates of the cosmological constant, a number proposed by Einstein to measure the amount of energy present in space itself.</p> <p>‘We know it’s not dramatically wrong, but we reached the moment where small details matter. A lot of effort for one tiny number, but this number changes the entire way we see the universe,’ Dr Rigault said.</p> <p><strong>Quasar lenses</strong></p> <p>Another way to challenge Cepheid and supernova distance calculations is to check them against alternative methods. That is what Professor Frédéric Courbin&nbsp;of the École Polytechnique Fédérale de Lausanne in Switzerland and Dr Dominique Sluse at the University of Liège, Belgium, are doing with their project <a href="https://cordis.europa.eu/project/rcn/214902_en.html">COSMICLENS</a>.</p> <p>They are using light from quasars which has been gravitationally distorted by the galaxies lying between the quasars and Earth. Quasars are extremely distant and active galaxies that are thousands of times brighter than our Milky Way.</p> <p>The beams of light take different paths around the objects, resulting in them arriving on Earth at different times.</p> <p>‘The time difference, or time delay, is directly linked to the Hubble constant,’ Prof. Courbin said.</p> <p>His team regularly uses telescopes such as the European Extremely Large Telescope in Chile or the Hubble Space Telescope to observe the quasars over months. They turn the measured time delays into cosmological parameters.</p> <p>‘Our method shows a value which agrees with the supernova estimates,’ said Prof. Courbin, adding that, like Prof. Pietrzyński’s findings, it disagrees with the value found by the Planck satellite. ‘The goal is to put the whole thing on a firm ground.’</p> <p>This discrepancy, he said, 'means that we do not fully understand the cosmological puzzle or that astrophysicists still have unknown sources of errors in the measurements of the Hubble constant.’</p> <p><em>The research in this article was funded by the European Research Council. If you liked this article, please consider sharing it on social media.</em></p> <br /> <img src=”http://www.google-analytics.com/collect?v=1&tid=UA-40077089-1&cid=refining-intergalactic-measurements-could-alter-our-whole-understanding-of-physics&t=event&ec=republish&ea=read&el=refining-intergalactic-measurements-could-alter-our-whole-understanding-of-physics&cs=republish&cm=republish&cn=republish&cm1=1" /> This post <a href="https://horizon-magazine.eu/article/refining-intergalactic-measurements-could-alter-our-whole-understanding-physics.html">Refining intergalactic measurements could alter our whole understanding of physics</a> was originally published on <a href="https://horizon-magazine.eu/">Horizon: the EU Research &amp; Innovation magazine | European Commission</a>. To address this, he and his team of USNAC project researchers have used the NASA/ESA Hubble Space Telescope to examine supernovae host galaxies with ultraviolet images. By doing this, they can measure the amount of dust left in the supernova's line of sight and gauge how such dust may alter its appeared brightness.